In the midst of all of the photos of Golf Road and bicycles and businesses, Johnny Kunzer, another follower of the blog, passed on this marvelous photo of the Schaumburg skyline. 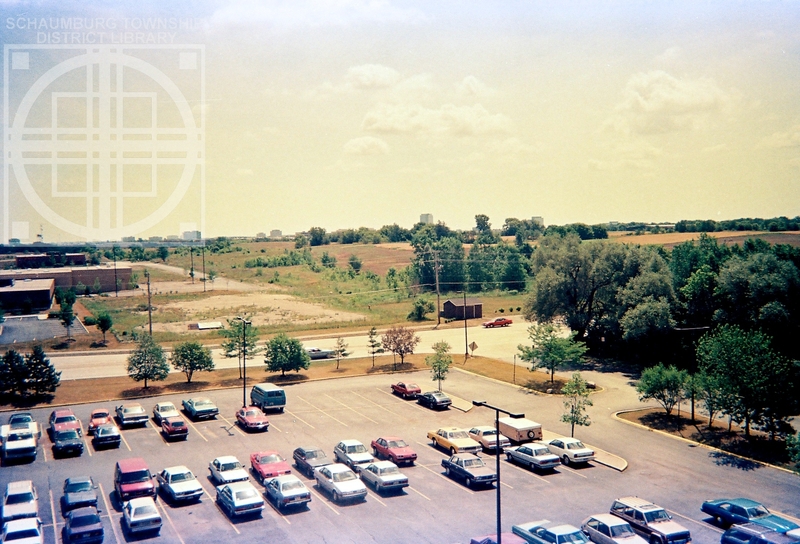 It was taken in 1987 from the 6th floor balcony of a friend’s apartment at XXI Kristin Place on Roselle Road. The road runs through the middle of this photo that shows almost…..nothing. 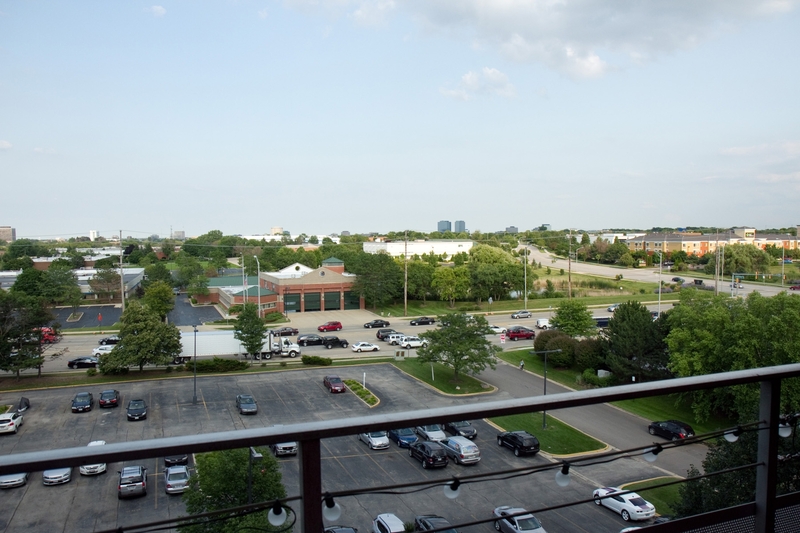 It is an indication of how undeveloped the village of Schaumburg was back then. But, if you look closely (click on the photo) you can see a number of buildings in the distance that are still part of the landscape. Unfortunately, the first building that we start with is no longer there. If you look closely in the middle of the trees on the far right you can see the roof of a low-lying building. Johnny thinks this is the demolished Woodfield Lanes and I’d have to agree. The building that is somewhat obscured by the trees is Prudential Office Building 1 that was completed in 1987. Moving left to the center of the photo is a tall building that towers over the trees. This is the first building of Plaza Towers, now known as Zurich Towers. It was also completed in 1987, the same year this photo was taken. If we adjust our view a little to the left, there are a number of other office towers shown. Johnny is fairly certain the first two are the office buildings on the northeast side of Woodfield Mall along Perimeter Dr. Schaumburg Bank has been in the taller one for many years. He also feels the two further to the left of those mentioned above are the two towers that were built to the west of the Hyatt Hotel on Golf Road. On the edge of the photo is the communications tower that is still there today at the Illinois Tollway’s Maintenance Site that currently sits on the southwest corner of the cloverleaf at I-90 and Route 53. Johnny thinks the structure to its right is the Schaumburg water tower. Would you agree? Moving in a bit more closely, it is obvious that the Commerce Tech Center that was built in 1984 is directly across Roselle Road from the apartment building. 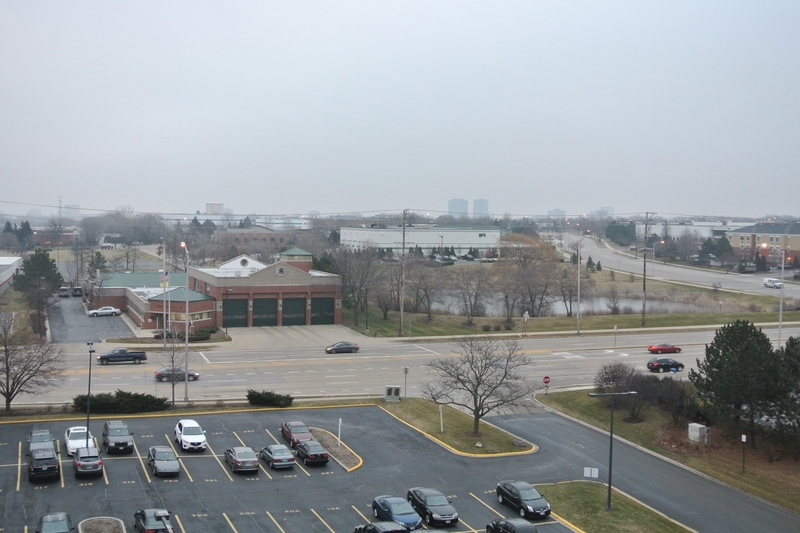 The dirt plot to its left is vacant and waiting for Schaumburg Fire Department Station 54 to be built in 1992. The $64,000 question, though, is what is that small brown building sitting in the middle? …and this is a view from the past summer with the leaves on the trees. Quite a difference from 1987, wouldn’t you say? If you can elaborate on any of the buildings or locales in either of the photos, I’d be delighted to hear your comments. The area is always changing and we don’t always notice it. Photos like these bring it all home. Oh, and there’s one last thing. Something in the photo directly above has been here since 1968. Care to take a guess what it is? My thanks go out to Johnny Kunzer for starting this conversation with the photo from 1987 and to Amy Schereck Beyer for completing it with her photos of 2014. Both perspectives have been a delight to share with the readers.